Several weeks ago, after a long hiatus, two Rosetta Stone initiatives were launched in this space. Each push for translations arose spontaneously after a Geert Wilders post. The first was for the article accompanying Mr. Wilders’ redesign of the Saudi flag, and the second for his open letter to Pope Francis. (lists of languages may be found here and here). The speed at which the translations of the first article rolled in surprised me. Mr. Wilders had struck a chord with our translators, some of whom sent in their versions of the text before I even emailed them to ask. Within forty-eight hours we were able to publish the article in seventeen languages, eventually reaching a tally of twenty-one (English original plus twenty translations). Several people emailed us that week to say how remarkable the operation was, and that only Gates of Vienna could manage something of the sort. That may well be true (I’ll have more to say about the matter later), but it’s important to remember one fact: Gates of Vienna did not do it. The entire network did it. I act as a “factory representative”, but I front for an entire factory that does all the hard, sweaty work. That’s the nature of a distributed network. Anyone who thinks I am in charge of one of these initiatives is sadly mistaken. It may seem that way because I’m the mouthy one who keeps the blog and maintains the database and the lists and does the basic co-ordination as the material rolls in. But no one is in charge. What you see here is analogous with the synchronized movement of a flock of birds: each member of the flock keeps his nearest neighbor in view at a certain angle and matches speeds, but there is no Flock Czar telling the birds where to go and how fast to get there. They already know; they don’t need to be told. And yes, it seems that we, the extended Gates of Vienna/ICLA network, are the only ones who do this sort of thing. It’s a peculiar type of operation that requires a lot of dedicated people working very quickly, independently but in coordination with one another. Over the years we have fallen into the role of facilitating the process. After thinking about it for a while, I’ve concluded that we — the extended network of which I am just one node — are the only ones who attempt these Rosetta Stone projects because structural forces come into play making it likely that only one such network will persist. Given a set of distributed volunteer networks that function within a repressive environment and share the same operational focus, various elements of the set will tend to merge within a finite and predictable period of time. 1. Extended networks of activists that operate under repressive (and often dangerous) conditions are made up mostly of volunteers, because funding sources can easily be targeted for disruption by government authorities or quasi-governmental lobbying groups. The operatives comprising the network thus tend to be self-funding, and are not part of a command structure. In other words, external repression imposes a distributed structure on the network. 2. Counterjihad translators by definition share the same operational focus. Since premise #1 applies to them, they will tend to cooperate freely among themselves, sharing texts, contacts, and information with one another. Given the relatively limited pool of Counterjihad activists, if two such networks exist they will inevitably come into contact fairly rapidly as individual nodes bump into each other. As soon as they do, they immediately begin sharing information and connections, merging the two networks into a single, more extensive one. 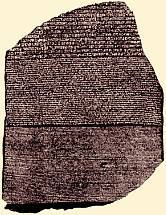 This has already happened within the Rosetta Stone network. The three major Counterjihad languages are English, French, and German, and each of these originally used to function more or less separately. But nodes of contact developed amongst those who have mastered two or more of the languages, and now we all communicate freely through those nodes. A speaker of Hungarian may have originally entered the process through the German branch of the Counterjihad. In a similar manner, Portuguese may have come in through French contacts. Scandinavians tend to be fluent in English, so they have generally moved into the larger network via the English-language nodes. Once an operation like this reaches a certain critical mass, it expands on its own without further prodding. That’s why the speed and extent of these latest initiatives was able to surprise me so much — I had no idea how much the network had grown since the first Fitna project several years ago. It’s humbling to witness such a development. Not everyone is able function in a distributed network. Some people have a set of internal rules that requires them to be in charge — in other words, they may only take part in hierarchical networks. No other options are available to them, given their own self-mandated rules. They may agree to be subordinate toadies to some larger warlord-of-the-web, but they don’t do horizontal networking. It just isn’t in their nature. People who are more cooperative in nature — and who live under repressive political systems — tend to form distributed networks in the same manner that ice forms on the surface of a pond when the temperature drops to freezing. Given the right ambient conditions and the laws of interaction (internally generated by each participant), the whole thing just happens. Like that flock of birds moving in perfect synchrony, with no one in charge. No one jealously guards his prerogatives. 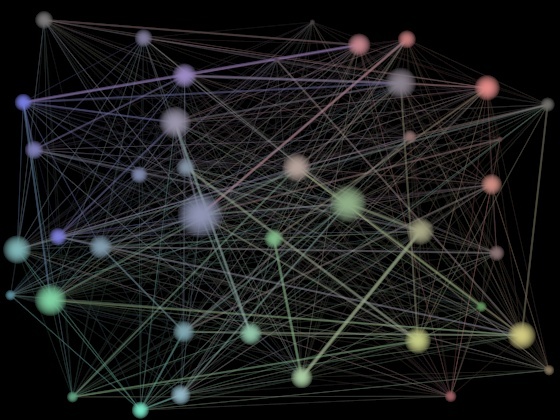 No one says, “This is my Rolodex, and you can’t borrow it!” Nodes from the several networks form mutual connections, and quickly become a single network. This is why only we can do this — because “we” are made up of networks that have already merged. This entry was posted in Civil Liberties, Counterjihad, Europe, Geert Wilders, UK, USA by Baron Bodissey. Bookmark the permalink. This is a mirror image of how jihad operates. The Loons always say, we’ve taken out Bin Laden (or Zawahiri etc. ), Al Qaeda is gone. But not so. Islam itself is what inspires jihad against the kuffar. A distributeed network. It’s smart to counter it in the same way. The distinction being the aesthetics and rational of the poetry formed by the CJ Distributed Networks. Check, Tak, but Al Qaeda and its multiplicity of ideological clones do have an operational/physical capability as well as a distributed ethereal presence whereas, at the moment at least, the C-J does not; it [the C-J] is essentially a multinational protest/proselytising movement operating in the open within a rather fluid and, country-wise, variable fence of legal parameters and thus in the main managing to keep the more terminal aspects of State oppression off of its neck. Indeed, there is a direct correlation between the establishment’s perception of the C-J’s actual ability to effect any change and the degree and nature of the force that the establishment jackboot applies and will apply to it. Hence the real crunch point will come when or if the C-J, or anyone else for that matter, is able to mobilise enough informed public support, both ideological and physical, in order to move up a gear, step out beyond the fence and become a presence on the ground in sufficient numbers to constitute a real and present threat to the deconstructionist status quo. Then, metaphorically speaking at least, will the body bags start to pile up – as, to a lesser degree, has happened to the EDL and several stalwarts within our movement – and the real time of trial will begin irrespective whether it arrives by commission or omission, i.e. whether it is co-ordinated or spontaneous. And, significantly or otherwise, tomorrow is the first day of the fourteenth year of the third millennium, a terrible centennial in its own right, and I too am taken by a sense of foreboding. The pressure cooker that this once green and pleasant land has become is close to the physical limits of containment, and the clamps that hold down the lid are ready to shear as tomorrow also marks the day where the mass movement of parasites and predators into this small, crowded island passes saturation point. Seneca III, Middle England, 31st December 2013. Thank you, Baron, for some excellent education, and thank you, Takuan Seiyo, for applying it to the functioning of Islam. I’ve been looking for the last two years or so for a way to describe Islam’s authoritarian-yet-vigilante physiology that will allow me to get the point across to people who aren’t yet awakened. Your application of the Baron’s distributed network construct may help. Agree. That’s why the mosques are so dangerous. Dymphna, Baron, May I wish you both a very Happy, Productive, Successful and Prosperous New Year. I am an armchair counter-jihadist. I would like to do more-much more. I try to engage people I meet regarding the muslim genocide of Christians. Maybe they are brainwashed by their denominational governing bodies & too busy boycotting the only country in the ummah where the Christian population is flourishing freely, Israel. I too was very surprised by the number and speed of the translations of Mr. Wilders recent thoughts. One can look at this in either a positive or negative fashion. Either volunteer citizens all over the globe have become aware of the threat of Islam and want to make their various fellow citizens aware of the impact Islam WILL have on their culture or, the infiltration of Islam to all corners of the globe has already reached a point that impacts the freedom and warps the culture of the average citizen hence, the volunteers’ efforts to push back by making information available in their native languages. I happen to think that the latter is the case currently in Northern and Western Europe while Eastern Europe is only just now experiencing the agitation of Islam in their cultures. Eastern Europe has a couple of things going for it: The relatively strong Christian faith among their populations and the lower level of social services, the dole, in Eastern European countries. In other words, it is much less likely that you will be able to seek asylum in a country such as, say, Poland or Romania and be able to live off the state along with your various wives and children all the while demanding more services and deference from the host country. Heaven knows that Eastern Europe has an excellent road map for where this all leads by just looking West.